Yeah, it doesn't throw errors, though I can't seem to find it or the research for it in any of the menus. Re:cultivator - aw, too bad, it looks super helpful in my goal of making a modern latifundia colony (an economy based on huge areas of farmland.) Guess I'll have to wait. Yeah, it doesn't throw errors, though I can't seem to find it or the research for it in any of the menus. Right now it's unlocked through "machining", but it'll probably change in later versions for A17. If 666 is evil, does that make 25.8069758011 the root of all evil? Ah, I hadn't thought to look there. Thanks. Adds stat upgrades that can be researched. Mining: Improves mining speed. Included Pneumatic Picks research back from Alpha 12 for nostalgia. Growing: Improves harvest speed and harvest success chance. Building: Improves construction speed and construct success chance. Animals: Improves animal gather speed and animal gather chance. Medical research: (Courtesy of KingSihv) Improves medical operation speed, quality and success chance. Nutrient flavoring: (name from rageage001) reduces mood debuff of eating mutrient paste meal from -4 to -2. Whats about further research ? - Dispenser create simple meals instead of nutri paste. I know where allready was something similar at very old releases. Oops, only just noticed this comment. I noticed orbital traders can't see cloth stored in deep storage, only on top of the platforms. Intended? Edit: Caravans can't see more than what's on top either, and the platform blocks light. Is there a A16 of SS Researchable Stat Upgrades? Yep, because the other only exist as numbers inside the storage and isn't part of your colony. You shouldn't see it at the colony overview either. Thats the drawback of this storage, but you can store more resourcs on 2x2 tiles then any other storage (quantum,extended storage). Unfortunately not, the new modding features of A17 are actually what allow me to make such a mod. Ty for your mods ! I just want to know the utility of ss clocks, it don't anderstand how i can use this in my game to have an eventual advantage. Does they are just cosmetics ? Yup, I just made it for fun, that mod. A simple QoL mod that throws a mote of the damage taken. [MODDER JARGON INCOMING] Uses and includes Harmony patch library. Non-destructive is the way to go. 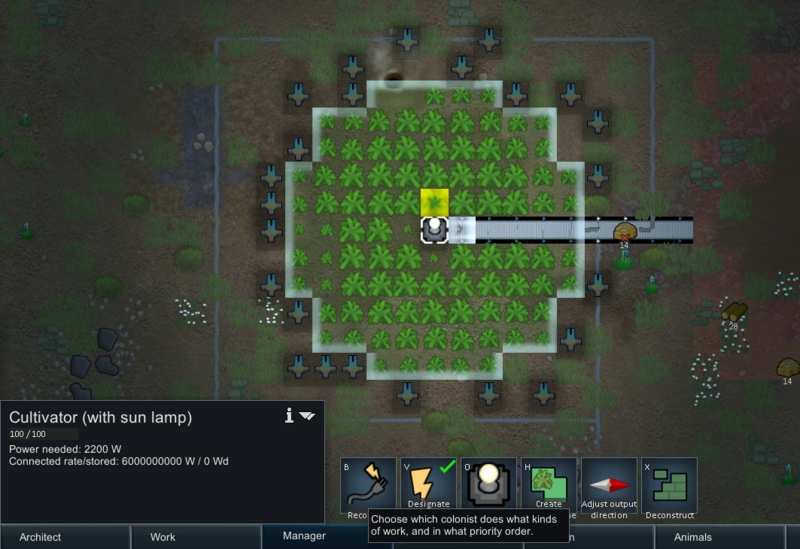 Is their any way to make the auto-cultivator haul all the harvested food into a specific area? I wanted to try and make a fully automated farm in combination with Industrial Rollers, kinda like Factorio.